It’s hard to believe the year is coming to an end already. Where has the time gone?! As a kid, I could never understand why grown ups would complain about how quickly time passed. Now I know. I have heard the whooshing sound of life passing by, and it is not cool! There are simply too many things I want to do in a day. Too many foods I want to try, places I want to see, adventures I want to have… and as much as I want to freeze time to do them all, I can’t. All I can do is live life to the fullest each day, and hope that at the end of the year I can look back at all the things I did do. All the places I went, the adventures I had, the friends that I made, and think… how lucky am I? And you know what? I’d say I’m pretty damn lucky. Too many good things happened in the past year for me to even count. I learned so much. I traveled. I got married to my best friend, and adopted a puppy who is way too cute for words. I made some new friends, and grew closer with old ones. I spread some love, made people laugh, and shared lots and lots of food. And I got to do something I love, nearly every day. What more could a girl ask for? Sure, I would’ve liked to make croissants from scratch, hop a plane to Italy and sit by the sea, write a novel, learn a foreign language, and lose fifteen pounds… but that’s what next year is for. Before the New Year officially begins, I thought I’d share some highlights from 2013. Highlights in food, that is. 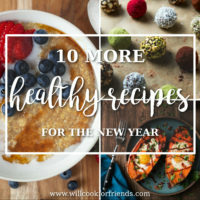 These are some of my favorite recipes from the past year. They’re the ones I make over and over again, and will always come back to when the cravings hit. What about you? What are your highlights (food or otherwise) from 2013? 1. 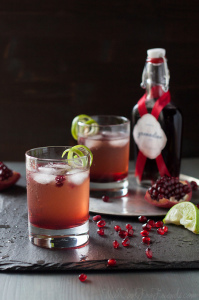 Pomegranate Ginger Fizz Cocktail — I’m not a big drinker, but this cocktail made the top of my list. It’s sweet, refreshing, and quick to throw together. I made my own grenadine syrup for the recipe (also incredibly quick and easy to make), and that just pushed it over the top! 2. Roasted Pear and Gorgonzola Salad with Balsamic Vinaigrette — my new favorite salad to make in the fall. The roasted pears and dried cranberries give just the right amount of sweetness against the saltiness of the Gorgonzola cheese. Add to that some crunchy walnuts and bright balsamic dressing, and I’m sold! 3. Amaranth, Quinoa, and Polenta Porridge — this breakfast porridge has just about replaced all other breakfast foods for me. I like to make a big batch and have leftovers all week long. My favorite toppings are maple syrup and fresh berries, but it’s just as good with a spoonful of jam, nuts, or whatever other add-ins you like. 4. Lemon Blueberry Ricotta Pancakes — okay, so that porridge hasn’t replaced all my breakfasts. I still love me some pancakes on the weekends, and these lemon blueberry pancakes top my list. The ricotta makes them super light and moist, like little clouds. Included with the recipe is my homemade pancake mix, which has become a pantry staple around here. There’s nothing like NOT having to measure flour, baking soda, and baking powder before my morning coffee! 5. Raspberry Chocolate Chunk Sorbet — it’s hard to think about cold things while there’s a foot of snow on the ground, but this sorbet was pretty much my only sustenance during the heat of the summer. It only takes a few ingredients, and comes together really quickly. If you’re not a fan of raspberries, it can just as easily be made with strawberries, cherries, or other fruit (like this Two Ingredient Mango Sorbet). 7. Salmon Cakes with Honey Mustard Vinaigrette — most of the recipes I make are planned out well in advance. I come up with what I want to make, then I think about it, and think about it, and think about it before I ever start cooking. These salmon cakes, however, were the result of throwing things together for a quick dinner. They were so good, I knew I had to make them again (and fast, before I forgot the recipe). I’ve made them dozens of times since, and they’ve become one of our favorite meals. They’re simple to make, and the patties can be stored in the freezer for quick week-night dinners. The dressing alone is worth the recipe! 8. Barbecue Bacon Cheeseburger, with Sweet and Spicy Chipotle Barbecue Sauce — I don’t eat a lot of meat, but every once and a while the carnivore in me speaks up. These cheeseburgers are pretty straightforward — patty, cheese, bacon — but the real kicker here is the Homemade Barbecue Sauce. 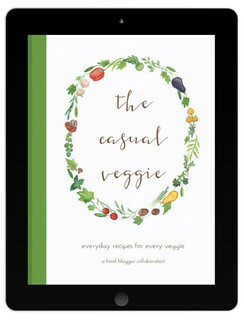 I lather that sauce on just about everything, from Sweet Potato Fries to scrambled eggs. Don’t judge. 9. 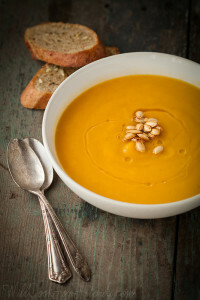 Roasted Butternut Squash Soup with Sage — this soup is one of my all time favorites. It’s incredibly smooth and creamy, without a drop of cream, and the flavors are warm and comforting, perfect for cooler weather. Plus, T-Hubs won’t touch anything with butternut squash in it, so I get the whole batch to myself. I count that as a bonus! 10. 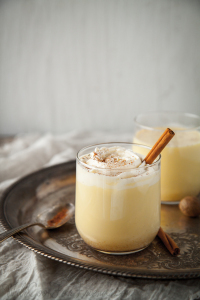 Easy Homemade Eggnog — I have never, ever liked eggnog. It has always seemed too rich and cloyingly sweet. That is, until I made it from scratch. 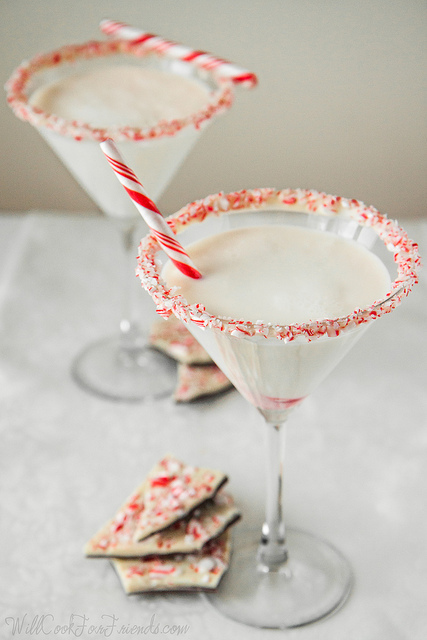 Homemade eggnog has officially converted me. It’s easier to make than you think, and I’ve included directions for cooking it to avoid taking chances with raw eggs. Topped off with a splash of rum and fresh whipped cream, this is my new favorite holiday beverage. 11. 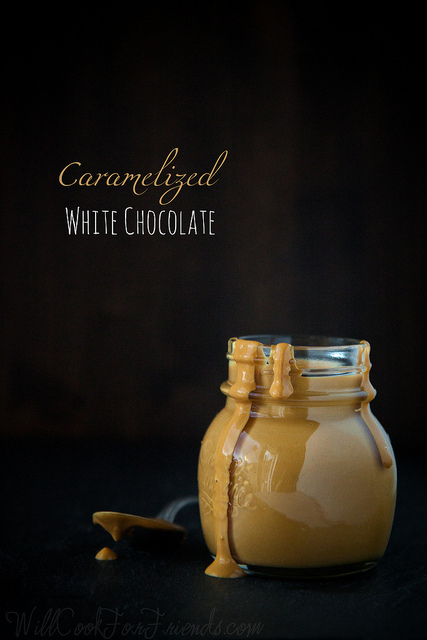 Caramelized White Chocolate — who knew white chocolate could be transformed into molten, golden caramel sauce? This best part is that it still acts just like chocolate, and can be tempered and used to make truffles or other confections. 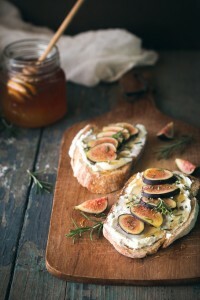 Or you can use it as I did, and just drizzle it on everything (like these Pumpkin Pecan Biscotti). 12. Chocolate Dipped Orange Zest Marshmallows — last, but by no means least, are these chocolate dipped orange marshmallows. It might seem strange, but I have made marshmallows from scratch dozens of times since first discovering them a couple years ago. They’re surprisingly easy to make, and the flavor possibilities are endless. I especially love these orange ones melted into a mug of hot cocoa — mm! That’s my list — what’s the best thing you ate in 2013? Share in the comments below! I think I’d very much like to be your friend. Let’s just start at the top of the list and work on down. Please? Haha, we can definitely be friends! Thanks, Erin — it was great to meet you, too! Happy 2014! Happy New Year, Willow! it sounds like you had quite a year! ‘m so glad that I discovered your blog in 2013 and am looking forward to all the yummy things this next year will bring ;) These days/months/years seriously do go by too too fast. Thanks, Amy! I’m glad I found you, too. Making new blog friends has been one of the biggest highlights of my year, for sure! Happy 2014! Have I mentioned before how much I love that copper pot of yours?! The pear salad looks mighty fine (they all do, but that’s what I’d eat right now if I could!) Happy 2014 to you! What a year! I love the mix you have on this list; I hope you continue with your FAK Friday’s- enjoyed and learned so much from these posts!